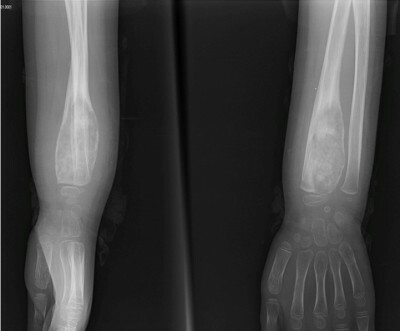 Abstract: Osteoblastoma-like osteosarcoma, a rare form of osteosarcoma, is a malignant lesion associated with risks of both local recurrence and distant metastasis. The differential diagnosis of osteoblastoma-like osteosarcoma from osteoblastoma and aggressive osteoblastoma remains controversial and challenging. Previous studies suggest that these three types of tumor are distinct entities. However, working out a precise diagnosis may not always be possible immediately on the basis of initial clinical, radiological, and histopathological features. On the other hand, the importance of a correct diagnosis cannot be overemphasized since the treatment strategies change dramatically according to the nature of the lesion. In all of our cases, initial Tru-Cut biopsies revealed osteoblastic features with minimal atypia, but further biopsies confirmed malignancy. A high index of suspicion and considerable experience are prerequisites for accurate diagnosis in case of clinicopathological and radiological discordance.